Brie Larson Reveals AWESOME New ‘Captain Marvel’ Poster; New Trailer Drops Tomorrow! Hold on to your butts! Some big Marvel Cinematic Universe News has come our way. Captain Marvel is easily one of the most exciting films to head our way for 2019, as Brie Larson’s Carol Danvers is easily the most anticipated MCU character to be given a stand-alone film since the days of the OG Avengers. Since the arrival of its official teaser a few months back, we’ve been craving to see more from the movie, and now thanks to some late news, we’ll be getting a great new treat tomorrow night. Thanks to star Brie Larson and her Instagram page, we now have official word that a brand new trailer for Captain Marvel will be debuting during Monday Night Football tomorrow on ESPN. Don’t be surprised here, Disney has used the MNF slot at this time of the year many times before. Both Star Wars: The Force Awakens and Star Wars: The Last Jedi both released their second trailers at this time. With Captain Marvel being such a high valued film at this point, it makes complete sense. Along win the news, Larson revealed a brand new poster for the movie. While only the second poster released, it’s the best piece of marketing the film has seen to this point. It’s absolutely incredible, showing an empowered Larson in all her Captain Marvel glory. We’ve heard multiple times to this point that she will be the most powerful being in the MCU, and this poster clearly depicts that. It personally leaves me ridiculously excited to see what the new trailer will show. I obviously don’t want to see too much, but I want enough to blow my socks off. Can’t wait. What do you think fans? First off, how excited are you for the new trailer? Have you seen enough or are you still waiting to see more? How about the poster? Am I overreacting about it? 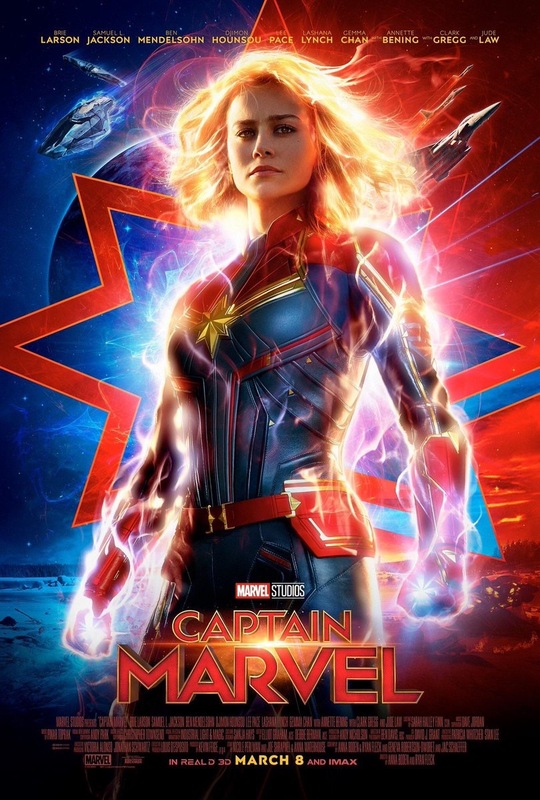 Also starring Samuel L. Jackson, Ben Mendelsohn, Djimon Hounsou, Lee Pace, Lashana Lynch, Gemma Chan, Annette Bening, Clark Gregg and Jude Law, Captain Marvel lands in theaters on March 8th, 2019.